LONDON, England (CNN) -- Russian billionaire Roman Abramovich is spending more than £240 ($340) per minute on his London football club, Chelsea FC, fresh figures have revealed. Big spender: Russian billionaire has spent about $1.03 billion on Chelsea since taking over in 2003. Abramovich, who took over the Stamford Bridge club in 2003, has since poured £710 million ($1.03 billion) into rejuvenating the team -- an amount that equates to the incredible $342 per minute. Despite the Russian's investments, the club has not been profitable since he took over, and last week reported a loss of $95 million for the year ended June 30, 2008. The club last year said it aimed to break even before 2009/2010. Do you think the money of rich investors has been good or bad for the English Premier League? "Following the conversion of half of the interest-free loans into equity there should now be no doubt as to the owner's commitment to the club and the stability of the company's funding structure. "We have always believed that this 'debt', now reduced by 50 percent, has been misrepresented. Chelsea has no external debt and makes no punitive interest payments to external funders," Buck said. 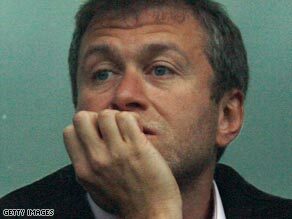 Much of Abramovich's spending had been buying new players such as Didier Drogba and Ricardo Carvalho. More than $30 million has been spent paying compensation to sacked coaches, including Jose Mourinho and Avram Grant. It has been reported Luiz Felipe Scolari, who was sacked from Chelsea last week, may leave with as much as £7.5 million ($10.7m) as compensation. At $342 per minute, Abramovich has spent almost $500,000 every day at Stamford Bridge.